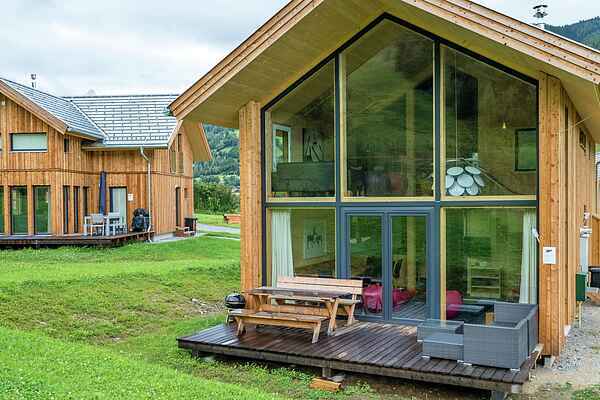 This luxurious detached wooden chalet is located below the ski lift and ski slope of the fantastic Kreischberg ski area. The historic town of Murau and the Kreischberg golf course are about 5 minutes away. Its central location makes it an ideal holiday area for visiting any time of year. With more than 200 days of sun per year, and guaranteed snow on the slopes, this is the perfect holiday environment for all seasons. The large detached wooden chalet was constructed in 2015 and is equipped with all the conveniences. The spacious chalet has 4 bathrooms with amenities that include a shower, an 8-person sauna and five bedrooms. The chalet's living area is on the ground floor. You will find a wonderful living room with an open-plan designer kitchen, spacious seating area, dining nook and even a cosy gas fireplace for the sociable winter evenings. From the living room you have direct access to an outdoor terrace with a jacuzzi and the garden. The entire accommodation has a beautiful oak floor and high-quality floor tiles. There is a private bar with a TV on the first floor. From the chalet and the terrace you have a view of the ski slope and ski lift and the surrounding mountains. The cross-country ski trail runs right behind the chalet. Because the area around the chalet is still under construction, there may be some building noise.